I was bitten by the Amy Kahn Russell bug sometime early last year. It happened innocently enough. A friend of mine, who worked in an art gallery outside of Boston, showed me one of Amy’s necklaces, which she had purchased for herself. It was a lovely multi-strand piece of purple and lavender stones mixed with pearls attached to an incredible magnetic clasp. A work of art in itself, the clasp was set with several beautiful stones. It fastened with a sturdy, magnetic "snap" that appealed to me greatly, both in appearance and function. I could feel an excitement rising within me, along with a telltale feeling of acquisitiveness, and I knew I was in for trouble. Returning to my hometown of Brooklyn, New York, I immediately went online and located several galleries that sold Amy’s work. One of them was Karen Burton’s Rendezvous Gallery, where I saw many photographs of the most amazing bracelets, necklaces and earrings, all designed by Amy Kahn Russell. I emailed Karen with questions almost daily. We discussed various pieces in depth. She sent enlarged photographs to me many times. Suffice it to say that I now have an extensive collection of the most distinct, unusual and wonderful jewelry! Imagine my delight when Karen asked me if I might like to do a short interview with Amy for her gallery’s website. So many questions had been bubbling around in my mind about the woman who had created these beautiful pieces, so I jumped at the chance. We set a time and I made the call. I was particularly interested in how Amy got her start in the jewelry business. I knew her education was in fine arts, but I wondered what had inspired her earlier on. Amy told me that from a very young age "I loved sculptures, anything three dimensional. I loved textures, colors, anything ethnic, exotic. I particularly loved Asian motifs, things like dragons. I also loved minerals, fossils, and anything to do with the water. I was always doing my art, mostly drawing, painting and making sculptures." Amy had various jobs selling jewelry as a young adult. At age 16 she started selling jewelry in a department store. Later she managed a pearl outlet in Hong Kong and started a business in Los Angeles with two of her father’s friends. Throughout these jobs, Amy continued with her own art on the side, which often featured water creatures such as fish and frogs. At a certain point she decided to marry her art with jewelry, thus combining her love for the three dimensional with stones, minerals, pearls and fossils. I wondered aloud where she finds the beautiful materials that comprise her pieces. Over time Amy has developed a tremendous network of people all over the world, including England, the Sahara, Russia, and throughout the US, who seek out rare and distinctive materials for her. Travel has been a big part of her life and a huge source of inspiration for her work. Amy’s overall goal in creating jewelry is "to give people a small piece of art to wear and to keep. Something timeless." 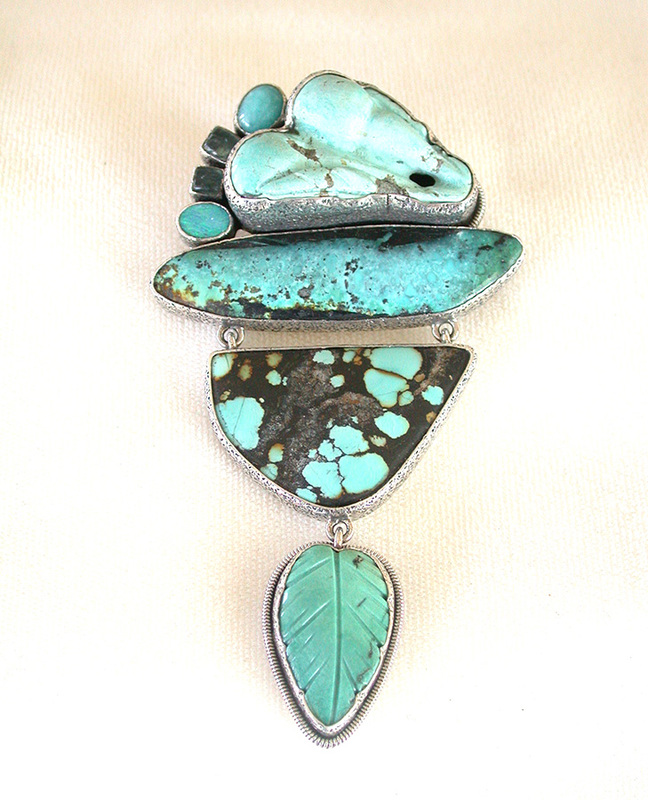 Many of her pieces are one-of-a-kind and all are designed painstakingly by her. They often start with a beautiful, unique stone or combination of stones that sit on a tray until an image of a finished piece forms in Amy’s mind. "The stones just lend themselves to certain thoughts and ideas; my inspiration comes in large part from the materials." Not surprisingly, Amy tends to reject many of the current trends in jewelry and to stay with her own creative spirit. She manages to maintain a steady flow of new ideas and often has a number of projects in process, such as the magnetic clasp, which can adorn on its own or join a necklace to a bracelet, thus creating a new and different piece. I asked Amy how she had managed to create such a flourishing business while raising a family; she is married with two sons. "It all just happened, it evolved over time. I worked while they were in school. We always had a lot of antiques and artifacts in our home, and we all traveled together, so everyone was kind of part of the business. One of my sons just adored the frogs I drew—in fact, we nicknamed him "Frog Russell" for awhile because he loved them so much!" This is the Amy I had hoped to discover: the one who has simultaneously raised a family, created an art form, and run a business. Her passion and dedication to her work, along with her completely down to earth manner and generosity in taking the time to speak with me, adds volumes to my appreciation of her work. And finally, it is well known that Amy’s work has been worn by many of the rich and famous, including Madonna, Halle Berry, Kim Basinger and numerous soap opera stars. Major magazines such as Vogue have featured her work. Some pieces are exhibited in museums such as the Natural History Museum. The list of prestigious venues where her work is sold goes on and on. And although Amy admits that this has its fun and thrilling aspects, she continues to remain committed to designing pieces that can be purchased and worn by people like me, who love to wear a small piece of art! This article may be reproduced, copied or quoted if credit is given to the author, Rendezvous Gallery and www.rendezvoustyle.com. Please provide a link to this web site. Prior written notice would be appreciated. The necklace arrived today and it's gorgeous! Even prettier than the pictures. A great addition to my Amy Kahn Russell collection. I'll really enjoy wearing this one! Thanks for the great service.